“Put your left hand here and play D and A,” Barbara said to me. I hit the note tentatively, feeling the eyes of my husband, my two kids, my daughter’s play date AND the piano teacher on me — all holding their breath. While I was a bit unsure about this it was definitely a different feeling than the last time I was a student learning to play the piano. I was probably about 7 or 8 years old when my parents started having me take piano lessons. I suppose it seemed like the natural thing for them to do. We had a beautiful piano in our living room, my older sisters were taking lessons, and my cousin was an accomplished and classically trained pianist. I don’t really remember if I expressed an interest in taking the lessons or if it was one of those things my mother thought was “the right thing to do”. What I do remember is that my piano teacher’s name was Ann, she would always sit next to me in a metal folding chair that my mom put out for her once a week and I was always called in for my lesson when I was out in the front yard playing with my friends. I don’t think I practiced that much but I do remember playing a childhood version of Ode to Joy (doesn’t every kid learn that?) and a few other catchy tunes that still pop into my head on occasion. Then, at about age 11, I went to gymnastics camp, sprained my shoulder while attempting a vault and couldn’t take lessons for a few weeks. For some reason I never went back to the piano. And that was the end of my piano career (or so I thought). I sometimes wonder if I purposely flipped off of the vaulting horse so I could stop taking lessons. I just don’t think I was that excited about the piano at the time. But as I got older, I would often “try” to remember how to play something, secretly wishing I was one of those people who could just sit down and have the music spill off my fingers. In college, I even signed up for lessons as part of some required music credits but I was either put on a wait list and never got into the class or didn’t want to get up for the 8:00am practice sessions. Who can remember? A lot of my college memories are a bit hazy (but no need to go into that!). I suppose I’ve been toying with the idea for a while now, thinking about things I’d like to try again as an adult, things I wished I had followed through on. My daughter expressed an interest in piano a few years ago so now my husband’s old upright that we moved from the in-laws is being used for her lessons. There it sits, in my living room, taunting me. 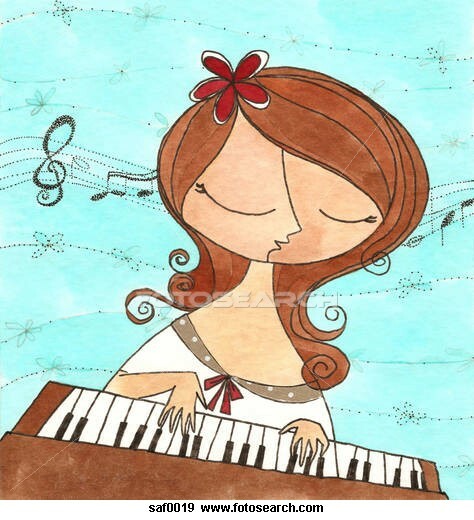 Sometimes I’ll try to tickle the keys, hoping I can make a little music and let loose but I remember very little. So I added this to my “52” and finally decided to take some lessons to see if I really want to pursue this again, but this time it was my choice to try something new…again. I asked my daughter’s piano teacher for a trial lesson. Although I was a bit apprehensive at first, Barbara’s teaching style suited me (although is was a strange role reversal for me sitting there with my daughter’s teacher!). Barbara takes a very individual approach with each of her students so no two lessons are ever the same for anyone. She put me at ease as she had me “try” a piece she brought for me and then read some music. I think I surprised both of us when I was able to get through the Beatles song she selected for me to try. I can’t say that it all came right back-but it was definitely buried there. I’m hoping it gets uncovered more. Throughout the lesson, Barbara gave me words of encouragement and said I have the potential to be a “piano player”. I believed her. I once heard someone describe the piano as a “friendly” instrument because it is so inviting and just about anyone can sit down, hit some keys and make a relatively pretty sound. Other instruments take enormous amounts of practice and learning about holding, blowing, or positioning before success comes at hitting just the right note. That’s what I like about the piano and about moving through my list of “52”. It’s accessible and inviting. Doing something for personal satisfaction but also something to share with others. It’s a good thing to try something new…again. Hi Pam, I was trilled to find your blog today. Will definitely explore more. What a great idea! I never thought I would play an instrument, always wanted but thought it’s to late… Now this is my challange, I’m very exited and really don’t want to give up too soon. Your post will encourage me to keep it up. Thanks. 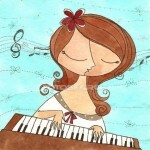 I took piano lessons for 10 years when I was a kid, and I got to be pretty good. A piano is a hard instrument to lug around, and I moved house a lot. Years passed without me sitting down to play. At Christmas awhile back, my mom bought me a nice “feels-like-the-real-deal” keyboard. It was one of the best gifts I ever received. 🙂 So fun to revisit those childhood hours on the bench!